The short answer is that I need to be active and to move. 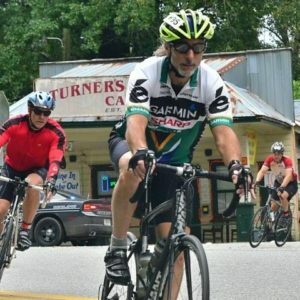 Several years ago a softball accident severely damaged my left knee limiting my ability to play sports requiring running with quick stops and starts but did not stop me from cycling. As a kid it was my main form of transportation to and from friend’s homes. I cycled to work following college and began to ride longer distances for recreation and exercise. Now as an older adult it improves my cardiovascular health, reduces stress and allow me to spend time outside with my family and friends. I do some of my best problem solving when I ride. Answers to tough questions frequently become clear. What I need to give to others and want from them begins to materialize. Plus, I love the mental challenge of riding up a steep hill or into a very strong headwind. Sometimes cycling is magic. When the conditions are just right and my riding seems effortless it is pure joy. Finally, it continues to challenge me. Beginning on Monday June 4th my longtime riding buddy, Lynn Loudermilk and I will travel to Pennsylvania to ride our bikes from Pittsburgh to Washington, DC a 340 mile trip over five days. We will ride along the Great Allegheny Pass and the C&O Canal Towpath (www.gaptrail.org and www.canaltrust.org) . This is the longest single trip we have taken together and I look forward to a great ride with a very good friend enjoying what I have been told is exquisitely beautiful country. You can follow our journey on our Facebook updates.